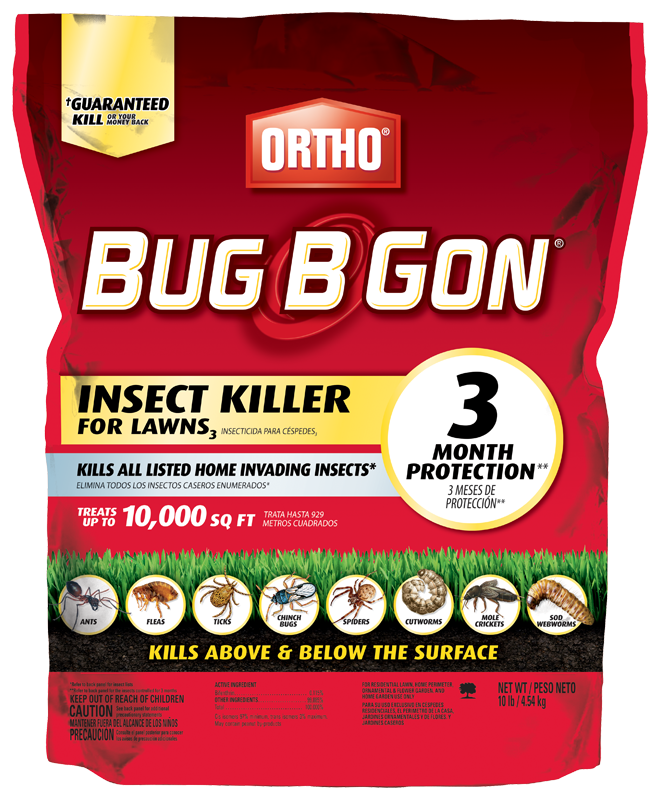 With Ortho® Bug B Gon® Insect Killer for Lawns3, you can enjoy 3-months of protection against listed home-invading insects including ants, ticks, spiders and more. It acts quickly to kill both above and below the surface and treats up to 10,000/20,000 sq. ft. Ortho® Bug B Gon® Insect Killer for Lawns3 can be used around listed vegetables. It is guaranteed to kill or your money back. A 10 lb. bag will treat up to 10,000 sq. ft. of lawn. A 20 lb. bag will treat up to 20,000 sq. ft. of lawn. For use on lawns, ornamentals, flowers, vegetable gardens, and home foundations. Uniformly apply 1 to 2 pounds over a 1,000 sq. ft. area of lawn using a spreader designed for the application of granular materials. For best results treated area should be thoroughly watered immediately after application. Do not apply to hard surfaces such as sidewalks, driveways and streets where the product is likely to wash off into sewers and waterways. Apply proactively in the early spring or summer to prevent infestation. Otherwise, apply at the first sign of insect activity or damage. Kills 100+ listed insects including: Ants, Asian Lady Beetles, Chinch Bugs, Crickets, Cutworms, Earwigs, Fleas, Grasshoppers, Lawn Moths/Sod Webworms, Millipedes, Mole Crickets, Spiders, Ticks, and Weevils. Your home and yard are places for your family and pets to enjoy. That's why Ortho® products are designed with care to provide effective solutions to insect problems outside your home. For best results and a healthy environment, please follow instructions for appropriate usage, storage and disposal. Product comes in a nonrefillable container. IF Empty: Do not reuse or refill this container. Place in trash or offer for recycling if available. IF partly filled: Call your local solid waste agency for disposal instructions. Never place unused product down any indoor (including toilet) or outdoor (including sewer) drain. People and pets may re-enter lawn after application once dry. SPREADER SETTINGS: For best results use a Scotts® Spreader. Refer to product label for spreader settings. NEW YORK RESIDENTS: In New York State, this product may NOT be applied to any grass or turf areas within 100 feet of a water body (lake, pond, river, stream, wetland, drainage ditch). Early summer beetles can leave behind their hungry grubs to feast on your grass in the late summer.